As part of its Canadian battle series, Mark Zuehlke offers its ninth installment and this time he returns to Normandy. After the first two books dealing with this battlefield (Juno Beach and Holding Juno) he returns to finish the job and covers the events between July 4 and August 21. 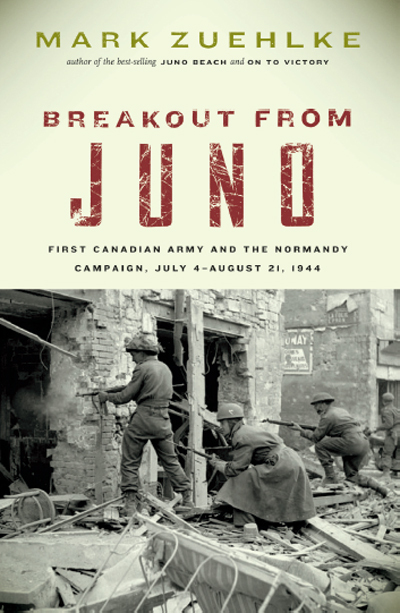 If you have not read any book of this series from Mr. Zuehlke and consider yourself a Canadian military history fan, then you’d better run to the nearest book store, and fast. I like Mr. Zuehlke’s work for its unsurpassed minute-to-minute details of the battles, which are thus virtually relived in first person. Drawing on extensive interviews with veterans and combining these with official documentation, he builds a comprehensive picture of the events as they unfolded. Covering so many personal stories of soldiers and civilians alike, the story might feel almost overwhelming at times. As a minor point I would welcome if the identification information of fighting vehicles would be more specific (especially on the German side, due to the plethora of vehicles used). Because of the depths of the experience however, I can only strongly recommend this series. For any armour modeller, the amount of inspiration in each book is unmeasurable. Breakout from Juno is of course sitting on my bookshelf right now, waiting for the On to Victory to be finished.